Europe is about to put a front-line weather satellite in orbit that has components which are over a decade old. The Metop-C spacecraft is due to launch from French Guiana late on Tuesday local time, and will circle the globe, gathering data that will feed into daily forecasts. The satellite was procured at the same time as its two predecessors, but was then stored for later use. A British instrument onboard was manufactured 17 years ago. The Microwave Humidity Sounder (MHS) will detect water in the atmosphere – everything from fog to the heavy rain inside a hurricane. Europe’s meteorological agencies say they have no qualms about Metop-C’s capabilities. The spacecraft has routinely been pulled out of hibernation and its systems checked to see they are still functional. The polar-orbiting Earth observer is fully expected to carry through its duties until the next-generation of technologies take over early next decade, states Dr Dieter Klaes from Eumetsat, the intergovernmental organisation that operates European weather satellites. “Metop-C was regularly tested. Whenever these satellites have been in storage, there is a health review,” he told BBC News. All three platforms in the Metop series were purchased from European industry at the turn of the millennium. It is the most efficient and cheapest way to acquire these multi-billion-euro systems. Metop-A was the first to launch, in 2006; Metop-B followed in 2012. Both satellites were expected to work for at least five years, and their continued operation today is a boon to weather forecasters. They will now get additional data to ingest in numerical models with the launch of Metop-C. The satellites are different from their geostationary spacecraft “cousins” which image developing weather activity from a vantage point some 36,000km above the equator. The polar orbiting satellites fly much lower, only 800km above the ground. Their job is to probe atmospheric conditions, detailing parameters such as humidity and temperature at different heights. The introduction of the Metops has had an astounding impact on forecast quality. Assessments indicate the data from the first two platforms reduced errors in the 24-hour lookahead by 27%. And there have been big gains also in medium-range forecasts – those that go out to several days hence. Eumetsat operates Europe’s weather spacecraft from its headquarters in Darmstadt, Germany. But the satellites’ design and procurement is overseen by Esa. It is currently working on Metop-SG (Second Generation). These spacecraft will have much more advanced instrumentation, and in a change to the current observing strategy – those instruments will be deployed across pairs of platforms. The British MHS will be succeeded by the MicroWave Sounder (MWS). It will have significantly improved performance. The first Metop-SG pairing is set to roll out at the end of 2022. These are interesting times in satellite meteorology because we are starting to see very small spacecraft being launched to monitor the state of the atmosphere. The new platforms are shoebox-sized, versus the 4-tonne Goliaths like Metop. “New space” companies – good examples would include Spire and Orbital Micro Systems – are looking to sell weather data and forecasts to private clients. 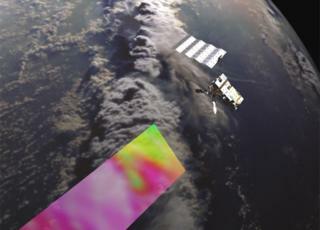 Dr Josef Aschbacher, the director of Earth observation at Esa, told BBC News that his agency was evaluating the data from smallsats but it was too early to say how these novel systems would eventually fit into the general observing system. “One should be careful not to make simple comparisons between the quality of a smallsat with a big sat,” he said. Metop-C is scheduled to lift off on a Soyuz rocket from Europe’s Kourou spaceport at 21:47 local time, Tuesday (00:47 GMT Wednesday).